Lismacue House, set amid a fine estate, a mile from the nearest road, this classically proportioned late-Georgian house is a haven of peace and tranquility. The present owners are Jim and Kate Nicholson. Kate’s family has owned the estate since 1704 and planted the magnificent early 18th century lime avenue. Each of the five large guest rooms has very fine views towards the Glen of Aherlow. One recent American visitor remarked that all bedrooms are bigger than his drawing room while the bathroom is actually larger than his dining room. 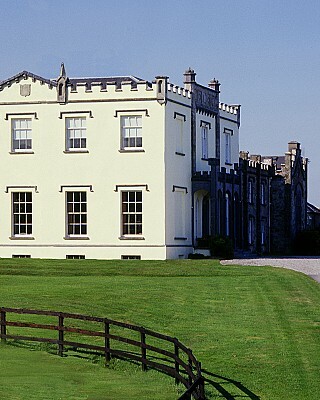 The Lismacue House estate, in County Tipperary, was purchased in 1704 by William Baker, a direct ancestor of the current owner, Kate Nicholson, and she and her family have recently celebrated 300 years of unbroken occupation. Lismacue House is set in the centre of a 200 acre demesne and is approached by one of the most impressive lime avenues in the whole of Ireland, planted in about 1760. The present Lismacue House was completed in 1813 to the design of William Robertson, an Irish architect with a large practise in the region. While a classically proportioned Georgian country house in every way, Lismacue House is covered with a subtle and delicate gothic layer, both internally and externally, which makes it all the more interesting and unusual. The drawing room and library still retain their original wallpaper, their superb mahogany doors, and much of their original pictures and furnishings, while the bedrooms are large, with wonderful views of the surrounding countryside. Outside are well tended gardens, trout fishing on the estate’s own river and five golf courses within a thirty minute drive. Horse riding can be arranged with prior notice, and there is wonderful hill walking in the Galtee Mountains and the nearby Glen of Aherlow. For the racing enthusiast there are race courses at Clonmel, Limerick, Thurles and Tipperary, while the Cork race course at Mallow is also well within reach.